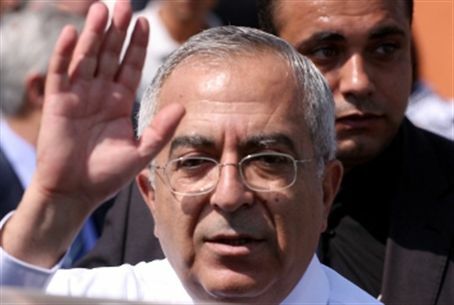 PA Prime Minister Salam Fayyad says his government will reduce expenses if donor countries fail to pay aid they pledged to the PA. The Palestinian Authority’s Prime Minister, Salam Fayyad, said Saturday that his government would reduce expenses if donor countries fail to pay aid they pledged to the PA.
Fayyad reiterated in a conversation with the Bethlehem-based Ma’an news agency that the PA would face a serious financial situation if funding does not arrive as promised. The IMF report he was referring to is one which was released on Saturday and which estimated a financing gap of about $500 million. The report was prepared for a donor meeting on aid to the PA in Brussels next week, Ma’an said. The PA is relying on donor aid to cover its 2012 budget deficit projected to reach $1.1 billion. The IMF on Saturday urged donors to meet their aid pledges to the PA, warning that unless funding was forthcoming it would be forced to cut public wages and social benefits to address a deepening fiscal crisis. The IMF said the PA economy had entered a “difficult phase”, Ma’an reported, with a severe liquidity crunch worsening since last year due to a drop in aid from Western backers and wealthy Gulf states and Israeli restrictions on trade. Most of the aid to the PA comes from the United States, the European Union and Arab nations, allowing the Palestinian Authority to pay the salaries of public workers and benefits. The U.S. cut off funding last year after PA Chairman Mahmoud Abbas made a unilateral bid for statehood recognition at the United Nations. The IMF’s mission chief to the PA-controlled areas of Judea and Samaria and Gaza, Oussama Kanaan, said it would be very difficult for the Palestinian Authority to cover the 2012 financing gap without donors making good on existing pledges and providing additional aid. He told Ma’an steady declines in foreign assistance had led to a large increase in domestic payment arrears of about $500 million to private businesses, and increased government debt to commercial banks to around $1.1 billion.